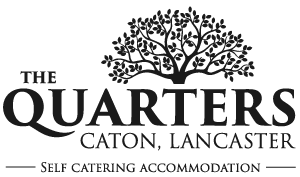 Our ideal central location in Caton, north Lancashire – makes us a great home base for you to visit, and enjoy many of the North West’s beauty spots. We’ll tell you about just a few of these below. We sit on the edge of the Forest of Bowland, a tranquil moorland gem, and area of outstanding natural beauty. The village of Caton is well equipped with a Co-operative convenience store (open until 10pm), a garage, a vets practice, and a doctors practice, and excellent pubs serving good food. The historic City of Lancaster with its magnificent 1000-year-old castle; vibrant music and festival scene; and eclectic coffee quarter is only a 10-minute drive from The Quarters. Don’t fancy driving? Don’t worry, the charming, flat, cycle path is ideal for guests in wheelchairs or families with pushchairs. The coastal town of Morecambe, Arnside, and similar destinations are waiting to be explored by foot or bike. Morecambe has a lively events calendar, with many weekends playing host to festivals and other celebrations. Do you have family studying or looking to study at either of Lancaster’s universities? Both the University of Cumbria (Lancaster Campus) and the University of Lancaster are less than 6 miles away. The Quarters is also ideally located for the Lake District (40-minute commute); the Yorkshire Dales (as little as a 30-minute commute), renowned climbing and walking, with show caves. Blackpool is also a 40-minute drive, and Manchester an hour. In the evening, enjoy a choice of three pubs, serving food, or simply relax in the tranquil Quarters garden by the stream.